East. Fast. Delicious. Perfect for weeknight meals. 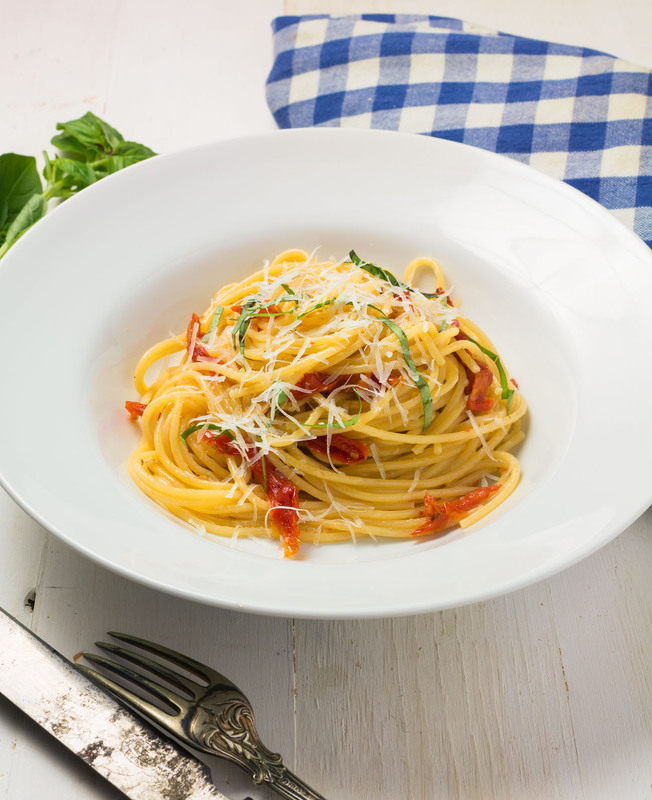 Spaghetti with sun-dried tomatoes and pecorino romano can be ready in less than 30 minutes. Or serve a smaller portion to start at a dinner party. Like they do in Italy. Primi and secondi. It’s a nice way to eat. 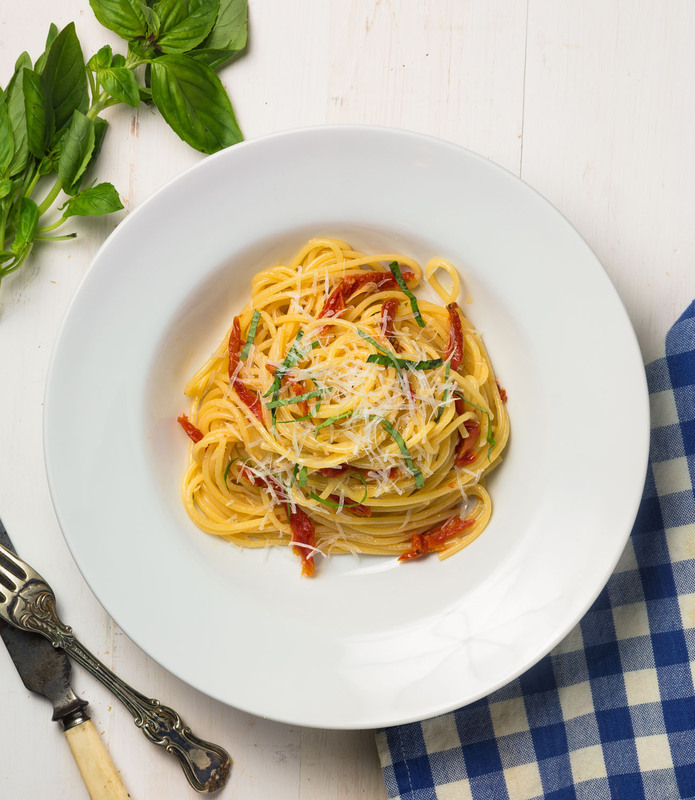 This is a riff on aglio e olio – the Neapolitan classic pasta with garlic and olive oil. It’s lighter on the garlic, adds a bright note with the sun-dried tomatoes and swaps out the cheese for pecorino romano. Basil replaces parsley to complement the tomatoes. But it’s just as simple. Just as pure. Just as good. 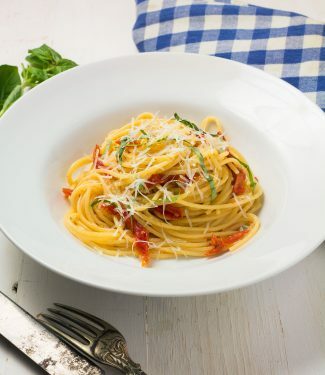 Spaghetti with sun-dried tomatoes and pecorino romano is a quick but delicious vegetarian pasta dish that comes together in 20 minutes. Put a pot of well salted water on to boil. Well salted means it tastes like the sea. Don't be scared. The salt goes down the drain. Cook the pasta according to the directions, but under cook by about 30 seconds. While the pasta cooks you can start the rest of the dish. Reserve about 1/2 cup of the pasta water. Place the olive oil and garlic in a cold skillet over low heat. Cook gently for about 5 minutes. You want to infuse the oil with garlic. You don't want it to burn. If it does, start again. Toss in the sun-dried tomatoes and stir to spread the tomatoes over the full surface of the pan. Add the cooked pasta to the skillet along with a good pinch of chili flakes and toss to combine. Add the pasta water and increase the heat. Cook until the water is gone - about one minute. Stir in the pecorino romano. Serve, topped with a bit more pecorino romano, black pepper and more crushed chilies if you like a little extra zing. In italian, main course, Vegetarian. Bookmark the permalink.